I have to admit that I'm not very good at knitting. Mostly it's hats, bags and scarves in simple patterns and occasional lace patterns. Since I'm trying to become a better knitter to realize some of the ideas in my head, learning more ways to start and end projects is essential. Leslie Ann Bestor's Cast On Bind Off: 54 Step by Step Methods has helped with that goal. This book is spiral bound to lie flat while you're working and printed in full color. 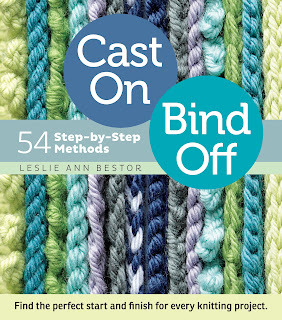 There lots of types of cast ons and bind offs for different applications. The step by step instructions have photos as well as well written text. It starts with a quick start guide to help out people just beginning. Then it goes into the cast ons. Each cast on lists the characteristics of it, and possible applications. Basic cast ons are the ones we may have started with, and are the foundation to many kinds of projects. Stretchy cast ons are the ones you'll want to use where you need a good amount of stretch, top down socks, bottom up hats, and things like that. Decorative cast ons are a lot of fun. There are two types, a lacy edge and a picot edge. Circular cast ons are worked in small rounds for beginning things that are knitted out from a center like circular shawls, top down hats, and bowl shapes. Double sided is my current favorite. Casting on stitches on 2 needles to knit bags and other things in the round that are joined from the beginning. I followed the instructions for Judy's Magic Cast On to start a sock type cozy for an iPod. Multicolor use different color yarns for a very decorative beginning. Provisional means you are working around a waste yarn, or in her tips, she suggests a circular knitting needle so you can knit off of it later to do a second side. Tubular edge also starts with waste yarn, works well for ribbing and looks just fantastic. The final cast on method is a perfect Möbius for scarves. Then the bind offs- how to finish projects. There are only 4 different types, but many styles in this section. Basic includes shapes like sloped and gathered. Stretchy has several kinds of elastic bind offs that can be used for areas you need to be able to stretch. Decorative includes the edge I used for the iPod cozy, it's an I cord knit edge. There is also a lacy edge and two picot variations. Sewn bind offs is the last type of bind off, and includes very useful Kitchener stitch. It's well indexed at the end, and the inner cover front has a list of the cast ons, and the inner back cover has a list of the bind offs, making them all very easy to find.